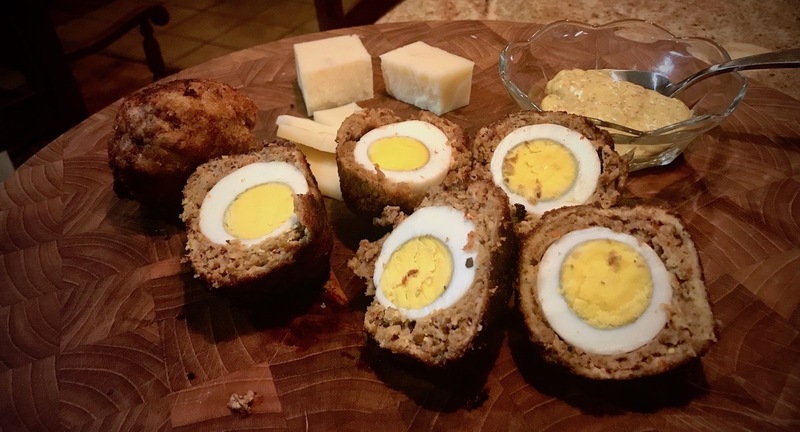 This recipe for Scotch eggs with venison sausage is a great appetizer for fall and winter dinner parties or gatherings at the house when the ballgame is on. Is it odd that I had never seen or tasted a Scotch egg until a year ago? Maybe they’re not as common in the South where I live, but I truly fell in love with this fried, sausage-wrapped boiled egg. Since trying my first Scotch eggs nearly a year ago, I have learned that the Minnesota State Fair sells Scotch eggs on a stick — ON A STICK! How lucky are these people in this state? My coworker Noel Lewis, who lives in Detroit Lakes, Minnesota, says Scotch eggs are quite common where she lives. “They’ve become popular around here,” she says. “You see them featured often now on the menus of newer, trendy bars and eateries in town." The Boiler Room, an upscale tavern in nearby Fargo, North Dakota, thinks so much of their Scotch eggs you can find an utterly appetizing image of these fried, breaded balls of protein on their website's homepage. Most believe Scotch eggs originated in Europe, likely London. According to Culture Trip, a blog about travel, food, health and wellness, the Scotch egg was invented by luxury London department store Fortnum & Mason in the 18th century. But the blog post left some room for doubt by acknowledging another place of origin. “Or was (the Scotch egg) in fact derived from the Indian dish Nargisi Kofta?” Debate over the Scotch egg's origin has been well documented. After falling in love with Scotch eggs — yes, love! — I wanted to try making them myself. Plus, I thought this snack could be a great way to use some of the venison sausage our family had been slow to polish off. The recipe and instructions are simple. The key to the whole thing is just making sure your grease is good and hot before you drop the breaded, meat-wrapped eggs in so things stay together, nice and tight. Boil four of the six eggs (two will be used to coat the boiled eggs for breading). You’ll want to ensure the eggs are cool, so boiling a day in advance is a good idea. Otherwise, put the eggs in ice after boiling to take the heat out. Next, create your assembly line: The first “station” is the sausage. Divide the meat into four equal parts. Pat each part into thin, little patties. In another bowl, you’ll have the two eggs you didn’t boil, whisked. The next bowl features the flour. The last “station” is a shallow bowl of bread crumbs. Wrap each egg using one small sausage patty. Dredge the sausage-covered boiled egg in the whisked egg bowl. Roll the sausage-wrapped egg in flour, shake off excess. Next, roll the soon-to-be Scotch egg in bread crumbs. Once the Scotch eggs are ready for the grease, pour oil so it’s about 2” deep, covering the surface of your cookware. Allow the grease to heat up enough so that when you flick a few bits of flour into the pan, the grease pops and/or sizzles. Drop each egg in, turn as each side becomes golden brown and the sausage is cooked through. This typically takes about 5 minutes. Season with salt and pepper. Serve with warm spicy mustard or whatever creamy dips suit your fancy. If you'd like to check out more recipes and tips on meat care, take a look at our Wild Eats section.